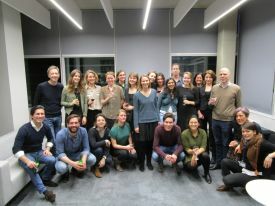 The Ethox Centre, the Department of Medical Humanities of the VU University Medical Centre (Vumc) and the Department of Philosophy of VU University in Amsterdam have established a Winter School for VUmc/VU’s students on the MA Philosophy, Bioethics and Health course and Ethox’s DPhil students. The week-long Winter School involves students giving presentations on papers published by staff members of Ethox and colleagues from the Wellcome Centre for Ethics and Humanities (WEH), and engaging in discussions about contemporary bioethical issues. The Winter School is organised by Suzanne Metselaar (VUmc) and Gerben Meynen (VU) and Ruth Horn and Michael Dunn at Ethox. Future plans are focused on expanding the Winter School into a larger student exchange programme and building stronger research collaborations between the two centres.